The System Configuration tool is more of a diagnostics tool, including some great settings for configuring the startup of your system. For starting the System Configuration tool, click your Start orb, type msconfig in your Search bar, and then press Enter. You can also open the Run dialog box and type msconfig. You will see a window having five tabs, and I will give you insight on how to use each one. Normal—Boots the system without any diagnostic services. If you are trying to diagnose a problem, you should select one of the other two options. When you are certain the problem is resolved, just click this setting to boot your system normally again. Diagnostic—This mode starts your system with basic services and drivers. With only the minimal services and drivers running, you can proceed with troubleshooting confident that your system is stable on a basic level, so the problem must be coming from higher up. Selective—This option allows you to start your system with basic services and drivers (just like diagnostic), but it also allows you to specifically configure the use of additional services and startup applications so you can slowly determine what is causing the problem in your boot process. You can go through and turn on items one at a time from the Service or Startup tabs and see how your system reacts when you reboot. Safe Boot:Minimal. Boots to the Windows GUI but only running critical services. Networking functions are also disabled. If you find your system is working at this level then you might want to try turning on services to see if they cause any further issues. Safe Boot: Alternate Shell. Boots to a command prompt. Critical services are running, but networking and the GUI are disabled. From here you can perform command-line diagnostics. Safe Boot: Active Directory Repair. Boots to the Windows GUI running critical services and Active Directory. Safe Boot: Network. Boots to the Windows GUI, running critical services and networking. If you don’t think your problem is in the networking services then having the network turned on for your system will allow you to access resources you might need on the network or Internet for diagnosis. No GUI Boot. Does not display the Windows Vista splash screen when you are booting. Instead, as mentioned earlier, the Aurora screen appears. Boot Log. Stores information from the boot process in a log located in %systemroot% called ntbtlog.txt. These logs can be sent to other technicians for their opinion on what might be causing your system to crash. Base Video. Just like VGA mode in times past, this mode loads the system with standard VGA drivers instead of those that specifically relate to your hardware. This option is good for eliminating problems with video drivers. OS Boot Information. Shows all the drivers during the boot process as they load up. Make All Boot Settings Permanent. Usually when you make changes, you can undo them simply by selecting the Normal boot process from the General tab (as mentioned earlier). But if you select this option, those changes can still be undone; however, the problem is that you have to manually go back and uncheck the options you’ve checked. Timeout Settings. You can configure different countdowns for your multiboot systems. You can try to type in what you like, but it will ask for a number between 3 seconds and 999 seconds. Advanced Settings. These advanced options enable you to configure such things as the number of processors, the amount of memory, and Global Debug settings. Keep in mind that these options are last-resort choices to diagnose your systems and are usually used under the direction of Microsoft support services. The Services tab shows a list of all the services that start with the computer when it boots. One can see the current statuses of these services & can enable or disable them from here. You can also deselect the checkbox to prevent that service from starting up the next time you boot the system. 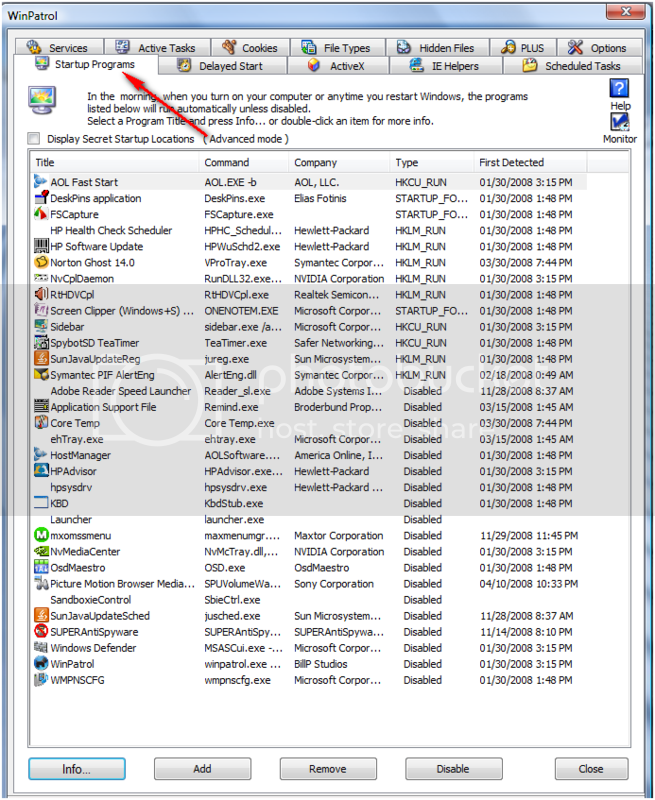 In disabling services, however, you are forced to use the Selective Startup in the General tab. You can also select Hide All Microsoft Services to show only the services from third parties. Be careful when you decide to disable a service because you might cause other problems while attempting to search for the one causing your original problem. Some services are required for your system to operate properly. Other services, if disabled, may throw off your diagnostic approach because you may be affecting other aspects of your OS. In other words, know why you are disabling a service before you do it, and understand how that service may impact other services or features of your system. This list provides a list of apps that start up. One can see the names of the application, the manufacturer, the location of the executable, & the Registry key for the startup application. You can also see a date when you might have disabled the application. From here, you can deselect the checkbox to stop the application from running on the next boot. If you feel there is a problem with a specific application, you can also confirm from here the location of the application.Many OEMs include programs that you may not want running at boot. This is the place to disable them. You’ll still have access to them when you need them though. Another way to disable these options is to locate the path for their startup in the Registry and remove the link for the application. The path is HKLM\Software\Microsoft\Windows\CurrentVersion\Run . Note: If you choose to Disable All, there will still be some that Microsoft needs to start due to the OS. The Tools tab provides a list of diagnostic and informational tools and shows the location of these tools. From within this tab, you can literally “Launch” any tool, or you can note the location or name of the tool itself. Note: This is one great little feature. So great in fact that for XP users, Microsoft released a little fix download that enables you to add the Tools tab to your XP System Configuration tool (because it’s not there by default). What’s great about this is that it’s a centrallocation to all sorts of tools and even a few preconfigured command-line options. For example, you can enable/disable the UAC from the Tools tab. We discuss the UAC options a little later, but just the fact that you can, with one click, enable or disable it, makes this a worthy tool to remember. A great third-party tool is called the MSCONFIG Cleanup tool. Sometimes you have to disable certain applications in the Startup menu, such as certain spyware and malware applications you find. Disabling these applications from MSCONFIG does prevent them from running, but it doesn’t remove them from your system or, more specifically, from your system’s Registry. The goal of the cleanup tool is to go into the Registry and remove these items. Very detailed guide for beginners. Thanks. A detailed and an informative read. If you have ever seen a computer in a reboot loop, you won't use msconfig to boot to safe mode. By selecting the /safeboot option in msconfig, you are re-writing the Boot.ini file such that the default boot option is into safe mode. If the computer boots into Safe Mode satisfactorily, all is well. However, with a damaged/infected machine, there is always a distinct possibility that will not be the case. Because the Boot.ini file specifies Safe Boot but the damaged machine cannot boot into Safe Mode, you have an endless reboot loop. Advice from MRU (one of the malware removal training sites) MalWare Removal • Malware Removal - Booting into Safe Mode Safely. Thank you nitin for the post it is very useful to the beginner and I am sure that it will help many. Thank you Corrine I have never personally tried to boot in safe mode from config and from your post and the readings I am glad I've not done so. Havin such imformation will help us all to help others. Thank you nitin for the post it is very useful to the beginner and I am sure that it will help many. Indeed! Thank you for the reminder, Seti. I meant to comment to that effect myself but got all wound up in the safeboot response. Thank you Corrine I have never personally tried to boot in safe mode from config and from your post and the readings I am glad I've not done so. Under "normal" situations it shouldn't be a problem. However, how do you define "normal" and "computer"? My observation is that most people use msconfig to control the startup programs. But for that purpose, I find it very impractical that one cannot resize the little msconfig window (at least I have not found a way to do that). For that reason, I use a little very useful program called WinPatrol ( BillP Studios: WinPatrol 2008 ). Here I can resize my window in any direction and it is much clearer what I am doing. Besides, the program has a lot of other useful functions. Last edited by whs; 15th February 2009 at 19:56. Last edited by seti; 15th February 2009 at 14:47. Reason: misspelling !" All in one place. nice guide. and this msconfig tool looks useful. bookmarking it.